The Rocky Mountain Suzi-Q impressed our testers with its versatility and good all around performance. This bike can do it all. The Rocky Mountain Suzi-Q impressed our testers in nearly every way earning it our Top Pick for Versatility Award. This bike is capable of doing just about everything from snow biking and bike packing to adventure riding and everyday mountain biking. It has the lowest Q-factor of all the models in this test which helps to make it feel a bit more like a "normal" mountain bike than the competition, with slightly narrower rims and tires that perform well on packed snow and dirt alike. The Suzi-Q has an alloy frame and a rigid carbon fork and is impressively lightweight and efficient and excels when pointed uphill. 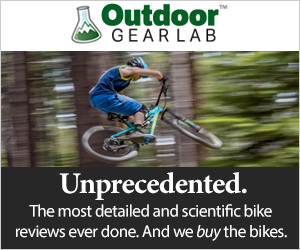 It's also a capable on the descents with a slack for a fat bike 68-degree head angle and a comfortable cockpit that provides precise handling. It can't quite match the downhill capabilities of the Kona Wozo with its suspension fork, but the Suzi-Q was our favorite of the fully rigid models on the descents. It also has the nicest component specification in this review with an XT drivetrain and SLX brakes helping to take its performance to another level. If you're looking for a bike to ride year-round no matter the conditions or the adventure, we think the Suzi-Q is a great option to consider. The Suzi-Q Alloy 50 is one of four models of the Suzi-Q that Rocky Mountain makes, all of which are designed around the same frame geometry. The Alloy 50 model we tested is the second least expensive model and comes equipped with the nicest component specification of all the bikes in this review. The Suzi-Q has a narrower Q-factor, the width between the cranks, than the competition and has the distinction of feeling the most like a regular mountain bike as a result. This lightweight and highly versatile bike can be used for any number of things, from snow biking and bike packing to everyday trail riding. During testing, the Suzi-Q quickly became a tester favorite for its efficiency, liveliness, comfortable geometry and solid all-around performance. Testing our Top Pick for Versatility winner, the Rocky Mountain Suzi-Q Alloy 50. Tester's found the Suzi-Q to be a blast to ride downhill with a lively demeanor and quick handling, this bike is only held back by its lack of front suspension. Its shorter length wheelbase of 1155mm is a bit of a detriment to high-speed stability but considering this bike's intentions it works well for the more moderate top end speeds you're likely to reach. That shorter wheelbase along with moderate length chainstays give it a relatively short turning radius, and thanks to the large contact patch of the 27.5" x 3.8" tires this bike absolutely rails corners on dirt trails. The Suzi-Q also has a playful attitude and feels willing to manual, hit the fun line, and pop small trailside features. The 68-degree head tube angle is the slackest of all the models in the test, tied with the Salsa Beargrease, which helps to give it a little more relaxed feel when the trail steepens compared to competitors like the Cannondale Fat CAAD 2 which has a 69.3-degree head tube angle and smaller wheels. The cockpit setup is generally quite comfortable, the 760mm handlebar is wide enough for a bike of this nature and coupled with the shorter 60mm stem gives this bike a precise steering feel. The quick release seat post clamp is a relatively minor aspect of the bike's build but testers agreed that this feature was appreciated for dropping the saddle for descents compared to the models with no quick release. The Suzi-Q's more relaxed head tube angle enhances this bike's downhill capabilities. As with any fully rigid bike, the Suzi-Q feels a little bit harsh riding over rough terrain, especially at speed. This was especially noticeable when riding it back to back with the Kona Wozo which has 100mm of front suspension. Of course, the Suzi-Q wasn't made to throttle through the chop and the rough stuff, it demands a more calculated, read: slower, approach to chunky rocks, roots, and snow than the Wozo. Compared to the other bikes in this test with rigid forks, however, the Suzi-Q was one of the most comfortable and intuitive on the descents, a distinction it shares with the Salsa Beargrease. Our testers were very impressed with the uphill performance of the Suzi-Q, this is one of the most comfortable and lively climbers of the bunch. The Suzi-Q feels incredibly lightweight and efficient and this is especially evident when climbing. It is a fully rigid bike, so obviously there is little wasted energy when you push on the pedals or get out of the saddle and crank away, everything feels tight and precise. It's also impressively lightweight for a fat bike with an alloy frame. At only 29lbs 12oz in the size large we tested, it's the second lightest model in the test, only one ounce heavier than the full carbon framed Salsa Beargrease. The bike's steep 75-degree seat tube angle, steepest in this test, puts the rider right above the bottom bracket for good power transfer while the moderate reach keeps you in a comfortable seated climbing position. The Suzi-Q is lightweight and feels very efficient and responsive when you're climbing or anytime you're pedaling. The Shimano XT 11-speed drivetrain works very well and there is plenty of range offered by the 11-46 tooth cassette paired with a 28 tooth chainring. The 3.8" Maxxis Minion tires have the same tread as 3 other models in this review and provide good traction and are suitable for a wide range of conditions and they hook up well on everything from packed snow to dirt. The Suzi-Q has relatively agreeable geometry numbers that help to make this bike feel efficient on the ups, nimble on the downs, and comfortable all around. It boasts the slackest head tube angle in the test at 68-degrees, giving this bike a more relaxed and less twitchy front end. Its also got the steepest seat tube angle of all the models tested at 75-degrees. This steep seat tube angle really gets the rider positioned right above the bottom bracket while seated pedaling for very efficient power transfer. Speaking of power transfer, the Suzi-Q has an impressively low Q-factor, only 170mm, which feels more natural and is much closer to the width of a normal mountain or road bike compared to the competitors with Q-factors 10-15mm wider. The bike's reach of 452mm is moderate in length and helps keep the rider in a relatively comfortable and neutral position without ever feeling cramped. The 1155mm wheelbase isn't the shortest in the test but it is on the shorter side of the spectrum, and when combined with the moderate length 442mm chainstays help to give this bike its short turning radius and lively personality. The Suzi-Q has agreeable geometry numbers that really give it its lively on trail manners. Its also got the lowest Q-factor in the test. The Suzi Q Alloy 50 has the most impressive component specification of all the models in this review. The bones of the bike are a Rocky Mountain 6061 alloy frame and their Smoothwall carbon C13 rigid fork. The frame has been designed to have a lower Q-factor, the width between the crank arms, which helps make this bike feel a little more "normal" underneath you than most of the other fat bikes we tested. Testers found this low Q-factor especially impressive considering the massive tire clearance of the rear triangle. Both the frame and the fork have numerous 3-pack mounts for attaching your bike packing accessories. The Suzi-Q is designed to be used with 27.5" wheels and it is also compatible with 29"+ wheels and tires. Perhaps the most impressive aspect of the build on the Suzi Q Alloy 50 is the drivetrain and brakes. Rocky Mountain has spec'd an 11-speed Shimano XT shifter, rear derailleur, and 11-46 tooth cassette paired with a Race Face Aeffect Cinch crankset with a 28 tooth front chainring. This drivetrain blows all of the other models in this review out of the water and works just as well as you'd expect it to. They left the stopping duties of the Suzi Q up to a set of Shimano SLX brakes which easily outperform the SRAM Level brakes found on all the other models we tested. The cockpit of the Suzi-Q consists almost entirely of Rocky Mountain house brand parts. Up front they used a 60mm Rocky Mountain AM stem and 760mm handlebar mounted with a set of Rocky Mountain lock-on grips. The handlebar is adequately wide along with the shorter stem that helps to give this bike quick steering and precise handling. They mounted a comfortable WTB Silverado saddle to a Rocky Mountain SL alloy seat post, and they even put a quick release seat post clamp to make lower and raising your saddle a little more user-friendly. The cockpit of the Suzi-Q is comfortable and uncluttered, plus they included a quick release seat post clamp that really makes raising and lowering the saddle a snap. The Suzi-Q rolls on a slightly narrower set of 27.5" SUNringle Mulefut 65 SL rims laced to a Rocky Mountain front hub and a DT Swiss 350 rear hub. Tubeless tape and valve stems are also included. The DT Swiss 350 rear hub uses their Ratchet System 18 freehub system which has a relatively unimpressive 20 degrees between engagement points but can be upgraded. A pair of Maxxis Minion 3.8" FBF and FBR EXO tires are mounted to those wheels which provide excellent traction. The slightly narrower rims give the tires a bit of a rounder profile and a somewhat more nimble feeling and versatile ride. The 3.8" Maxxis Minion FBR rear tire, you can fit slightly bigger but the tire clearance is somewhat limited on the Suzi-Q. The Suzi Q is by no means a one trick pony. This versatile bike is capable of doing just about everything from snow biking, bike packing, adventure riding, or even regular mountain biking. It has all of the frame mounts you could ever need to gear up for bike packing, yet it's lightweight and has comfortable geometry numbers that perform well for everyday riding. Testers also loved the fact that you can run 27.5" fat bike tires and you have the option of switching to 29"+ tires if you choose, taking its versatility to another level. That said, the Suzi-Q has a bit less tire clearance than most of the other bikes in this review which may limit the width of the tires you can fit and may make it a bit less useful as a dedicated snow bike. The Suzi Q is far from the least expensive fat bike we tested, but with a retail price of $2,449 and easily the best component specification in this test, we feel it is still a good value. The Suzi Q blew all of the other competitors out of the water with its impressive build that includes a Shimano XT drivetrain and Shimano SLX brakes. Combine that with this bike's lightweight, versatility, and great all-around performance and we feel this bike is well worth the asking price. Good all-around performance, a great component spec, and impressive versatility are the hallmarks of the Suzi-Q. The Suzi-Q was a definite contender for our Editor's Choice Award, but in the end, it was bested by the Kona Wozo and its cushy front suspension. Regardless, it is without a doubt one of our tester's favorite bikes and a truly capable ride that performs well in virtually all conditions and situations earning it our Top Pick for Versatility Award. There's nothing this lightweight bike can't do, whether you want to go bike packing, snow biking, or trail riding on dirt singletracks, it has you covered. It has a comfortable geometry for long days in the saddle, it climbs like a goat, descends as well as any fully rigid fat bike we've tested, and comes with an impressive build. If you're looking for one bike to do it all, then check out the Suzi-Q. Rocky Mountain makes the Suzi Q with both carbon fiber and alloy frames with the same geometry as the Alloy 50 model we tested but with different component specifications. The Suzi Q Carbon 90 ($ ) is their top of the line version that comes with a full carbon frame, Shimano XTR brakes and drivetrain, and a carbon handlebar and seat post. The Carbon 70 ($ ) also features a full carbon frame but comes with Shimano XT brakes and drivetrain. There are 2 alloy models including the Alloy 50 reviewed here and the Alloy 30. The Alloy 30 ($ ) has the same alloy frame and a similar build but with notable component downgrades including SRAM Level brakes and a SRAM NX 11-speed drivetrain. Rocky Mountain makes another model of fat bike called the Blizzard that comes with massive 4.8" tires and can be purchased with a Rock Shox Bluto suspension fork. There are 3 models of the Blizzard ranging in price from $999 to $2,399.